Grand Prairie Mobile Auto Repair, in Grand Prairie, TX. are here to get you back on the road fast! The fact that we are mobile means that we can save you money by keeping our overhead low, also you get to avoid towing charges, and you don’t have to wait in the mechanic’s waiting room! We can fix and repair your car and truck in front of your house or apartment or on the road. Our primary goal whenever we do any mobile auto repair is complete customer satisfaction. We want to make sure that your car, truck, or van keeps running like the day you bought it or better. 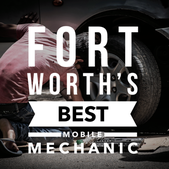 We are ASE certified mobile mechanics in Grand Prairie, TX. to give you the confidence that we have the training, knowledge, and tools to do many types of on-site mobile auto repairs. If your car, truck, or van repair is too complicated to do on the road, we work with several professional mechanics in repair shops around in Grand Prairie, TX. that we can easily tow your car to for more in-depth service. Our mobile mechanics typically do general repair and maintenance in any safe location your car is parked. So, if you are in trouble with your vehicle in Grand Prairie, TX. then don't be panic, just simply call us and we will be there within a very short time. Grand Prairie Mobile Mechanic : 682-847-7898 Mobile Mechanic Grand Prairie, TX.